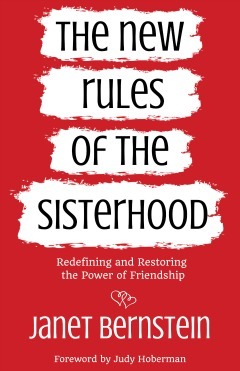 Author Janet Bernstein released her book, “The New Rules of the Sisterhood: Redefining and Restoring the Power of Friendship.” The time has come, ladies! For too long, we believed there weren’t enough seats at the table and women are competition. The authentic and outspoken author challenges those beliefs and encourages us (through humor, common sense and a little sarcasm) that we need our sisters and creating healthy relationships with them is possible. Her new ’rules’ are what we need to change the conversations and start rebuilding the sisterhood. Bernstein was interviewed on WFAA Good Morning Texas on the book’s release date, 4-8-19 to share the mission and vision for this book. as well as details on her heart-centered, membership based women’s organization, The Every Heart Project. Her confident and lively personality captured the Texas audience, creating a buzz on social media and her new online community book club. In addition to sharing her passion for connecting women, Bernstein opened up about losing two friends to suicide: Shelley Storm and Caitlin Ussery Staten. Following the deaths of her friends, Bernstein admits to stopping production on the book to incorporate a dedication to each woman, as well as the Suicide Prevention Lifeline. She talks in her Good Morning Texas interview about going back to the book and including guidelines for creating a safe space for women to open up about depression, anxiety and mental health challenges. She adds, “If we don’t open ourselves up to talk about this, these women are going to continue to suffer in silence, and we’re gonna lose more of our sisters.” Bernstein proudly displayed the signature teal and purple suicide awareness ribbon in her interview. Author Janet Bernstein is the founder of The Every Heart Project, as well as a Visibility Coach and branding expert with Savvy Girl Media. She is the author of six books, and loves to champion women everywhere by helping them step into their greatness and harness their power in their lives and businesses. “The New Rules of the Sisterhood” is now available on Amazon and bulk orders of 25 books or more are available with a discount. Please contact info@everyheartproject.com via email for more information.